The VJBK1TVV is an affordable, turn-key solution package ideal for use by professionals and up-and-coming video journalists. 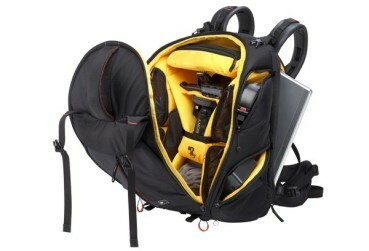 Packaged in a backpack designed for maximum protection and storage of your gear, the kit comes equipped with a compact professional recorder, full wireless microphone system, pro headphones, Xperia tablet, VAIO laptop, tripod, LED light kit, as well as cables and accessories -- all the tools necessary for capturing high-quality video, audio, editing, lighting and even teleprompting. UWPV1/3032 full wireless microphone system provides a body pack 'lavalier' microphone. Included the package is Sony's latest Xperia tablet PC which can be used for playback of clips in the field, or alternately as a teleprompter. It can also be used for watching videos you've just shot, as well as for researching information on any of the items included in this kit. A video tripod is essential for not only keeping the camera steady during interview shots, but also allows for making smooth pans and tilts through the use of a fluid tripod head. This tripod also has a remote control built in, that will help in capturing smooth zoom shots with your NX30 camera. This series also has a VAIO laptop option supplied with Sony Creative Software's Vegas Pro software. Vegas Pro is perfect for editing the clips that you've captured, and for adding that finished look to your video creations.You'll also be able to burn DVD and Blu-ray Disc® media and also prepare your productions for uploading to the web. The kit also contains an 'on-camera' LED video light. Having proper lighting on your subject can make a big difference in the quality of your video. This light is dimmable, and can be set to match both indoor and outdoor lighting conditions, and is even cool to the touch. It also uses the same rechargeable batteries that the camera uses, or AA batteries. All of the cables, batteries and charger, lens cleaning kit, additional memory card, and other accessory items that you'll need to take full advantage of this portable camera production package are included. The backpack is designed for maximum protection of your gear, and includes a rain cover and a work mat to lay out your gear, as well as providing a lightweight and easily portable storage solution for the equipment provided in this kit. Included in the package is Sony Creative Software's latest version of Vegas (TM) Software. Vegas Pro is perfect for editing the clips just captured and for adding that finished look to video creations.